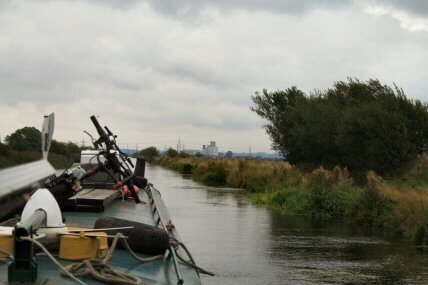 Having replenished the gas and been unable to top up with diesel its time to head off to Keadby. 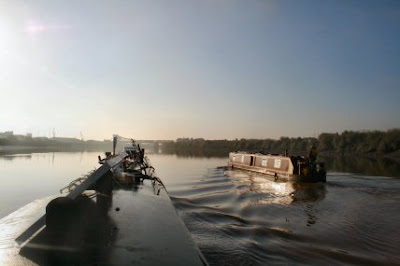 Going astern is 100% better than previous. 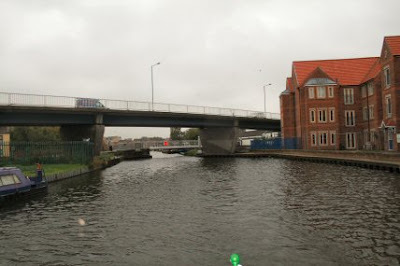 The pedestrian bridge over the canal seems to be behaving better that usual although the key does need a bit of jiggling about to get the gates to unlock. 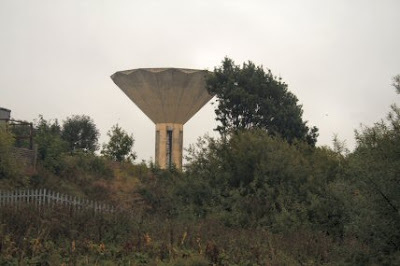 A little further on and a glimpse of the Thorne giant concrete mushroom or if your name is Abz then its the giant funnel. I stop to pick up diesel at Bluewater Marina and annoy the staff for five minutes. :-) Nice people and I usually call in when around here just to say hello. This is where nb Abigail Jenna came from originally. As I left nb Madame Butterfly passed and opened the lift bridge and let me through. 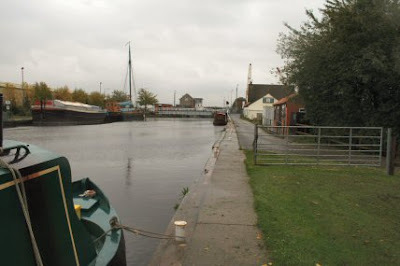 I did the next one at Moores Swing Bridge but had to stop and go back and pick up my key which I left in the control. It wasn't long but there is something that holds the key in if its not taken out and I had to call BW to come and reset it. 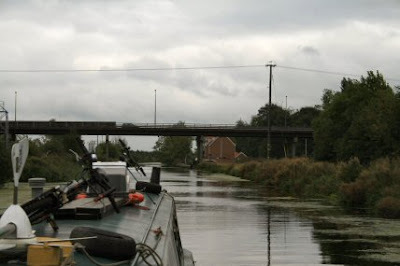 By the time I got to Crowle bridge I was really pleased to have a bridge to go under. 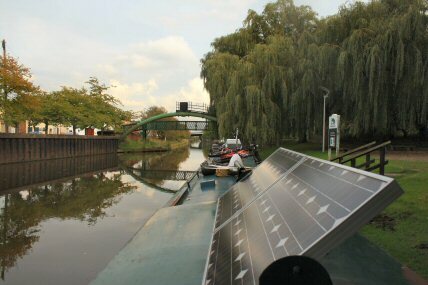 The cross winds where an absolute pain and several goes were needed to leave the bridge moorings. At one bridge the wind caught the boat and I just went sideways into the bridge. 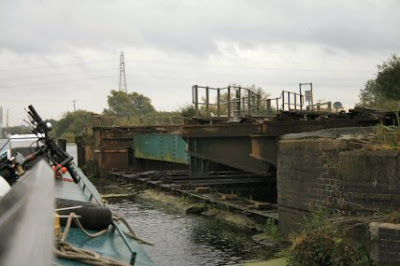 A fender got snagged up, the boat pulled in to the bridge and one of the drip bars on a window was ripped off. Still could have been worse. For a moment I thought the whole window had gone. 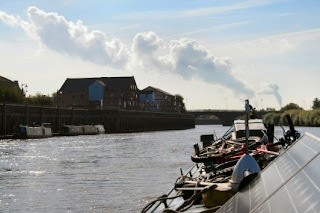 Eventually the power station at Keadby hove into sight. Fed up with going sideways along the canal. Through the last swing bridge and past Vazom Railway bridge. I still can't figure out how it manages to work . 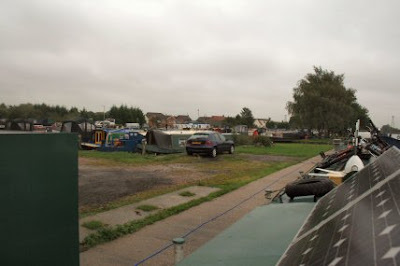 At least it hasn't been raining very much on the trip but soon starts once we have arrived at Keadby. nb Madame Butterfly is going out on the Trent with me tomorrow. Thursday morning and the weather has changed. The wind has died down and the mist augers well for the day ahead. Very autumnal. The tide for us is at 0900 so a civilised hour to start. 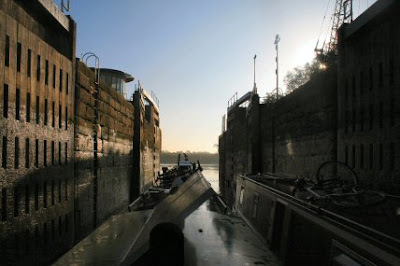 Sharing the lock and we are let out at just after 0830. I go out first and remember not to turn right. You only do it once. As the tide has not yet turned it doesn't matter and the Trent is quite calm. nb Madame Butterfly is picking someone up at Gainsborough to is putting his foot down so that we arrive at Torksey together. The new prop seems to be working well and, if anything, the engine sounds better. 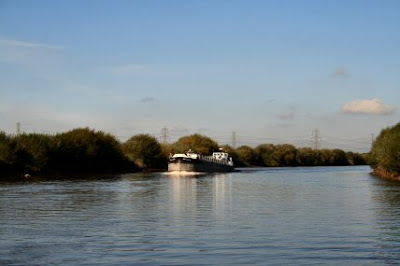 You feel quite small on the Trent but on some corners you do wish it was a bit wider. The Heather Rose H is met coming downstream loaded with ballast. Give her a wide berth and happily not on a bend. 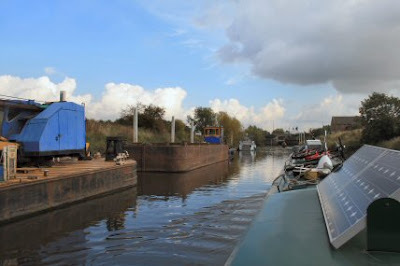 I soon get overtaken by Battlestone running empty to pick up her own load of ballast. I slowed down to let her past as not far from here is a nasty bend that could make things awkward if I kept my speed up. 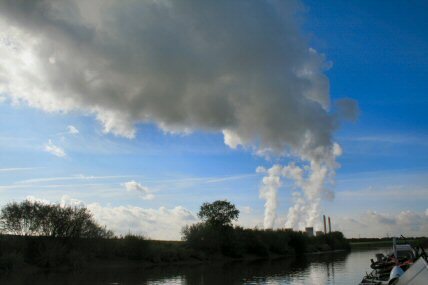 The power station cooling towers make their own climate. 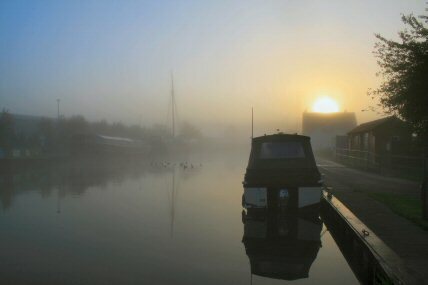 As the steam turns to clouds and obscures the sun the temperature drops a fair bit. 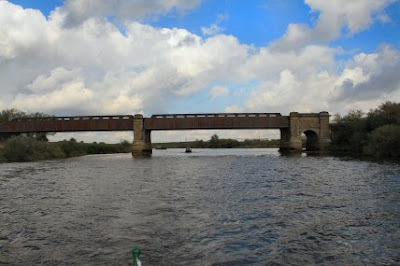 Nearing Torksey and the Torksey Viaduct. I look back and I have been caught up by a couple more boats. 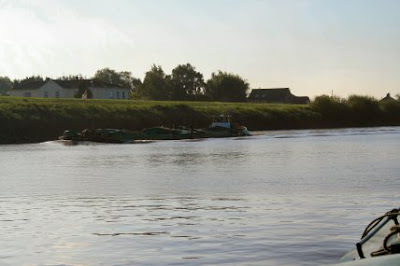 They carry on up river. At Torksey Lock and my travelling companion is just in front of me having caught up again. I don't like giving the engine too much stick if not required. Into the lock and tie up to the sides and its here I notice that the engine exhaust is actually under water. Look in the bilge and it is well full. After a bit of messing about I find that the new prop is throwing water up through the weedhatch and the extra speed I have been doing hasn't helped. Saxilby and the cats favourite place to vanish. Must make sure he is well secured tomorrow.